For Sickness Volume Four, ^|SiCk0|^'s composition technique and sound palette have greatly expanded. By hacking various commercially available audio editing programs, ^|SiCk0|^ creates a sound which simply cannot be emulated by any other artist. Having modified many 1980's era instruments and toys, ^|SiCk0|^ is known for being a pioneer in the "circuit bent" instrument technology. As well as the aforementioned unique new sounds, listen for the eleven minute long "Fistula" boasting an abstract collaboration with fellow IR artist Duma Love. Nauseate yourself with the CD, downloads and videos on February 14th, 2010. This Valentine's Day you can make your loved ones ^|SiCk|^. "Chunderful! GET yourself a glass of water and lie down in a darkened room - The Sickness is returning. 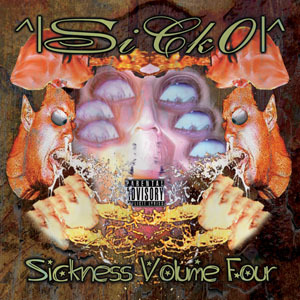 And on Volume Four, German producer Sicko's strain of dance is as playful as it is disturbing."